I hope you all had a great weekend. It was a lovely weekend with lots of sun here although according to the weather reports we’ll be seeing some very cold weather soon. I guess I don’t mind as that means I can spend more time in the studio without being distracted by going out to do things. This weekend I was in the middle of bookbinding. I’ve had books in process for months so it was time to finish some up and start planning the next ones. So aside from my little coptic bound postcard journals, I’ll have more sketchbooks and some new journal types. It’s so much fun to create. As my husband was helping me take pictures of some of the finished books so I can post on my Etsy shop, he found some old calligraphy work he doesn’t need any more and gave those sheets to me. I’m so excited. I can incorporate some of the pieces into the “junk journals” I’m making so I can’t wait! Of course as I’m planning my next journals that means a lot of time going through scrapbook papers, Italian decorative paper, marbled paper, and other beautiful papers that I’ve accumulated over the years. I’m really drowning in paper over here so I guess I better get busy making more books right? haha. Anyway, that’s the scoop from over here. I have got to tell you about some of my current reads soon. I’m in the middle of some good books. How about you? What have you been up to? Oh, I can see some of those Nancy Drew covers! I love the one I got from you before. I’ll be watching to see what you have available before long at your shop. I think this talent of yours is so fun. And, stay warm and safe in the next few days. I may or may not be doing that book club event tomorrow. Wouldn’t be surprised if the library closes if we get as much ice as predicted. 🙂 I love my Nancy Drew cover, too. 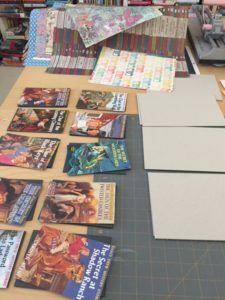 You should be having fun and reducing stress with all of your bookbinding and junk journal activities. Getting in that creative zone can be good for mental health! Jealous of your husband’s calligraphy work; can’t wait to see you incorporate in your journals. Sounds like you had a great productive weekend, Iliana! I am eyeing those covers in your picture and plotting out which ones I might like. 🙂 After the My Little Pony movie, my daughter has an art project she wants us to work on. Hopefully I can get her to write out that last thank you card while we are at it . . . Have a great week! Kay – Thank you! I love making books and find it so relaxing. And, just saw that all libraries are closed due to the weather. We’ve had such a crazy winter haven’t we? My book group cancelled today’s meeting as well. Stay warm! Jenclair – Thank you! And, I totally agree, nothing like keeping busy with artsy pursuits to stay calm and happy. I’ve missed spending time in the studio so it’s great to get back to it. Literary Feline – Aw thank you! That’s so cute – I love that Mouse is all into artsy stuff. I hope you’ll share pictures as I’m sure she’s going to come up with some beautiful stuff!